Add a burst of savory flavor to your dishes with this Oasis Italian dressing! Featuring fresh ingredients and zesty spices, this dressing can be added to a variety of dishes as a quick and easy way to enhance profitable menu items. It fuses the flavors of zesty garlic, onion, and red pepper in oil and vinegar to deliver just the right amount of light and tangy taste to your customers' food. 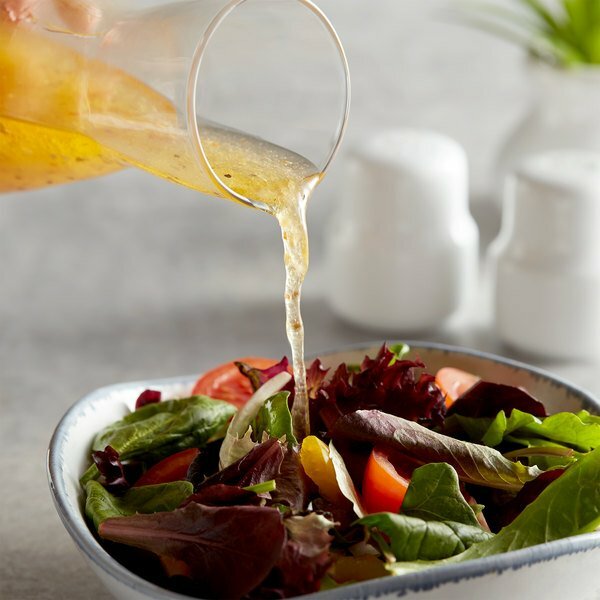 Italian dressing has an eye-catching, translucent, light orange color and a smooth, delicate consistency that's similar to the consistency of vinaigrette. This classic dressing is perfect for drizzling over house salads. Since salads make such a popular menu item, it's important to satisfy your patrons with great-tasting dressings! 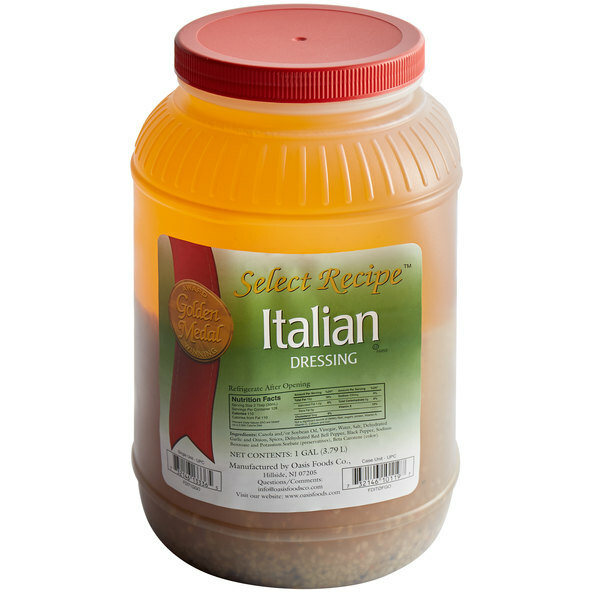 The zesty taste and smooth texture of this Italian dressing will delight your customers with the traditional taste they know and love. Mix it into cold pasta salads to add cool, zesty taste! Aside from salads, this versatile dressing can be used as a marinade for stir-frys and meats. Or, let this dressing soak into fresh breads to give any sub a satisfyingly tangy flavor. Whichever way it's used, it's sure to add a flavorful kick to meals at your restaurant, salad bar, deli, or diner! This Italian dressing tastes just like any well known, high priced salad dressing. It is inexpensive on Webstaurant. I would highly recommend this for any buffet, commercial kitchen and cafeteria. Great salad dressing at a great price. Like the large containers so you don't go through it as quickly. Overall great dressing, use it for salads. This is a good tasting Italian salad dressing. The quality and quantity are also a plus for the great price. These are great to keep on hand. `The Italian dressing is zesty and tasty. Depending on your tastes you can use a little or a lot compliments any pasta or salad as it would traditionally. But do not forget the added flavor it can add to chicken and beef when marinated perfectly. Good price for 4 gallons of dressing. However there is a lot of oil in these jars. All the flavor stays at the bottle no matter how many times we shake it.